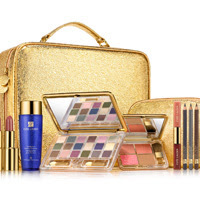 The Estee Lauder Professional Makeup Artist Color Collection 2010 contains everything a woman needs to look gorgeous for every occasion - Available to purchase when you purchase any Estee Lauder fragrance. The Gold Collection features a large gold zip-around traincase with handle and luxurious gold zippers. A companion case in a stunning gold pouch that perfectly complements the gold traincase. Deluxe Face Compact with 3 Signature Blushes,1 Bronze Goddess, Bronzer and 1 Blush Applicator. Pure Color Long Lasting Lipstick: 4 Pure Color Lipsticks. Artist’s Eye Pencil: 3 Artist’s Eye Pencil shades. Makeup Remover: Gentle Eye Makeup Remover 100ml (full size). Makeup Brush Set (4 piece): Powder Brush, Blush Brush, Lip Brush, and Eye Brush. Makeup booklet providing a guide for two different makeup looks, using the shades offered in the collection. This is available to purchase for €69.00 with any Estée Lauder Fragrance purchase. The value of this amazing collection is €427.00.